Gertie Gear � designed with you, your pet, and our planet in mind. Gertie Gear — High style, low maintenance orthopedic air beds designed with you, your pet, and our planet in mind. The Gertie Gear pet air bed system was designed and is manufactured with sustainability in mind and we are consistantly researching and adopting more practices to maintain and increase the sustainability of our products while reducing our ecological footprint. We don't just focus on what our dog beds and cat beds are made of; we also concentrate on where, how and who makes them, as well as how they are packaged, sold, shipped, and how long will they last. Gertie Gear pet air beds are constructed to maximize the "life" of the product while minimizing the resources used to clean and maintain the pet bed's appearance, yet still provide a practical solution for owners who want the best, most comfortable support for their pets without sacrificing individuality or style. Materials used to make a Gertie Gear pet bed are chosen for their durability and longevity. From the protective marine canvas undercover to the heavy duty zippers and even thread, Gertie Gear materials are commercial to industrial grade. Slipcovers are made of durable, machine washable apparel fabrics. They are for dogs and cats for pete's sake -- NO "dry clean only" or "wash by hand" here! 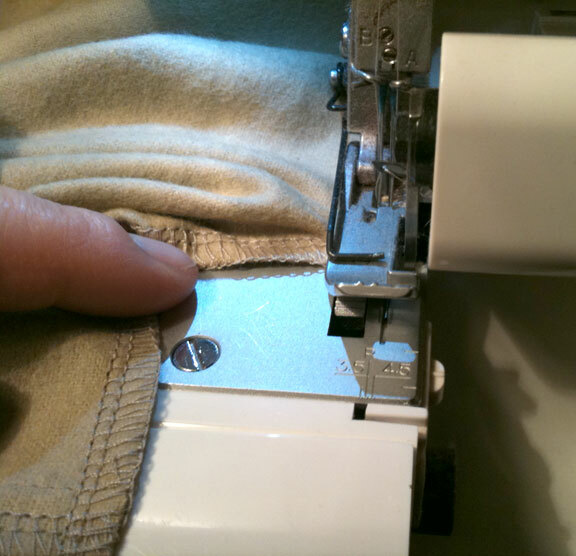 Seams are sewn with poly wrapped, poly core thread for maximum strength. Seam ends are backstitched and fabric edges are surged to avoid loose threads, fraying and to create a finished, professional appearance that will stand up to regular washing. Many of the pet bed slipcover fabrics offered are made with natural fibers including our organic cotton selections. Other synthetic fabrics and fabric blends are chosen for the unique features they provide (i.e. dog and cat hair clings to some fabrics less than others and therefore require less frequent washing) and/or their ability to minimize the appearance of wear and fading even with repeated washing. Remember learning about the industrial revolution and interchangeable parts? You know, the concept that gave rise to American industry and made the US a leader in manufacturing? What ever happened to THAT idea, and why aren't products "made like they used to be"? Gertie Gear's three part air bed system "is"; if used and cared for properly, these cat and dog beds will outlast, outperform and outclass most other pet beds several time over. "Gertie" is an old dog. The traditional foam and stuffing beds she had in the past quickly compressed and began to decompose with regular use and cleaning. Traditional pet beds are often difficult to wash and some larger beds won't even fit in the washing machine. We often had to keep more than one bed at a time and Gertie's old dog beds had to be replaced every month or two. Gertie Gear pet air beds are easy to keep clean and fresh. Minimize energy use and keep the air beds looking great by just washing the lighter, outer slipcover regularly. Launder the canvas inner cover less frequently to remove odors and allergens, or if bed is urinated on or other accidents occur. Please Note: Gertie Gear obtains fabrics and other materials from various domestic suppliers but cannot guarantee country of origin of all components. While the majority of inflatable tubes are made in China (as labeled), the final protective canvas under covers and fabric replacement covers are completely crafted in the USA by American citizens for a fair wage using hand operated cutting tools and standard sewing machines. We understand and acknowledge that a Gertie Gear "air-stuffed" pet bed is not a 100% perfect solution, but we'll keep working on it and hope you keep working to minimize your own ecological footprint as well. WARNING: Air beds are NOT recommended for teething puppies nor highly destructive "chewers"! Though inflatable is protected by industrial, claw/nail-proof canvas, NOTHING is completely chew proof. Air beds are NOT toys and are NOT for human children! IMPORTANT: please review our Policies & Legal regarding RETURNS/EXCHANGES before ordering. ©2004 - 2019 gertiegear.com. All rights reserved. Powered by Shoppe Pro.